Luton Town Ladies fell to a 1-0 defeat at Denham United in their FA Women’s Premier League South East Division One clash on Sunday. Manager Nikki Baker handed a full first team debut to centre back Jemma Moore who started as a replacement for Rachel Kosky. The winning goal came in the 20th minute when Denham were controversially awarded a free kick moments after there had appeared to be a foul on captain Rachel Carter, Alissa Down drilling the set-piece into the net. In-form Jess McKay went close to equalising nine minutes later when a perfectly weighted ball by Shaneice Jimenez reached her in the box, but with just the keeper to beat, she headed against the post. Striker Jodie Bellinger was narrowly over, while Jimenez’s effort from range flew just wide. After the break, the best chance fell to Bellinger who rattled the bar on the hour mark, while Lucy Webster’s cross was volleyed over by Nicola Henman. Speaking afterwards, Baker said: “I am always disappointed to lose, especially to a really soft goal like that. “We created some good chances but if I am being honest I just don’t think we did enough to win the game. 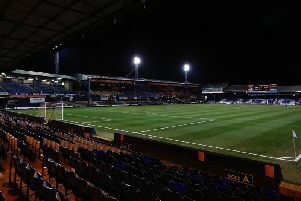 The starting line-up included four 16-year-old players with Moore making her debut and Baker reiterated how pleased she is with the youngsters at the club, adding: “Although I was forced into several changes, and we had four 16-year-olds on the pitch, I thought they did very well and dealt with the pressure brilliantly. “I constantly go on about our youngsters and how good they are and another one has made her debut at centre back in Jemma Moore. “She was superb to just slot straight in there and is one for the future”. Hatters travel to Stevenage in the FA WPL Plate this weekend.